The only people who seem to want face-to-face meetings and personal phone calls anymore are school principals. 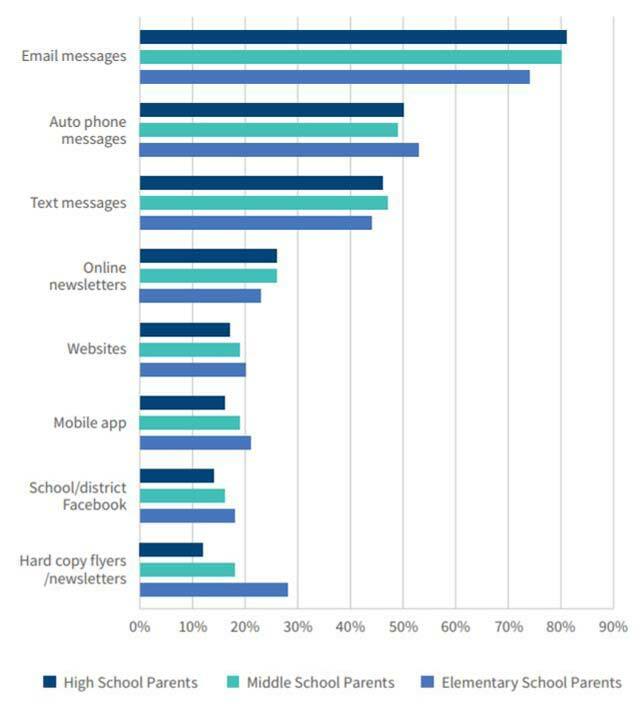 Four in five parents consider e-mail the most effective way for schools and districts to communicate with them. While one-third of parents with children across all grade levels say the personal phone call is an efficient way to communicate with them, 72 percent of principals endorse that strategy. When it comes to in-school meetings, the difference of opinion is just as dramatic; at the elementary level, only 45 percent of parents consider face-to-face sessions effective compared to 73 percent of principals; at the middle school level it's 35 percent of parents compared to 67 percent of principals; and at the high school level it's 30 percent of parents compared to 58 percent of principals. A new report from Project Tomorrow and Blackboard drilled into these trends in community engagement, analyzing responses from 514,000 K-12 students, parents, educators and community people who shared their views between October 2016 and January 2017 as part of the annual "Speak Up Research Project for Digital Learning." Blackboard sells parent and community communication applications. According to the researchers, parents put more value on e-mail, auto-phone and text messages for receiving non-student-specific information, such as alerts or more general announcements. Principals, on the other hand, acknowledge that auto phone messages and e-mail are effective tools but place more value on school and district websites and social media sites such as Facebook. While 45 percent of parents want information texted to them, just 19 percent want to head to a website to get the same type of information. School leaders want to do a good job of parent communication, but they consider it a major challenge — one that may even be "waking them up in the middle of the night." They're increasingly turning to social media as a tool for communicating with parents, but parent preferences for that communication tools appear to be at odds with that move. "The data shows that parents value having information pushed to them rather than having to search and find it on their own," said Julie Evans, CEO of Project Tomorrow, in a press release about the report. "Given the time pressures faced by most parents, this is not surprising. What is surprising is the disconnect we see between what parents and administrators say are the best communications tools. Asking parents these questions — instead of guessing — is important for schools and districts to be sure they are spending their time and resources in the most effective ways." The survey found that while 42 percent of parents with kids in K-5 say they're satisfied with teacher-to-home communications, just 23 percent of parents with middle schoolers and 19 percent with high schoolers share that view. This difference in satisfaction, according to the report, may be attributed to the "one teacher, one class" format followed in most elementary schools vs. the multiple, subject-specific teacher model used in later grades. Parents specifically called out the "variableness of usage between teachers." Maintaining communications with multiple teachers at the middle and high school levels "can be especially challenging" for some parents. Tell parents what you need and why it's important. The complete report on communications is available with registration on the Blackboard website.